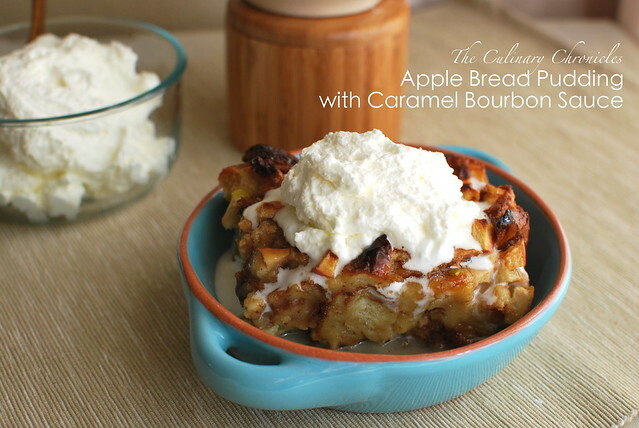 Apple Bread Pudding with Caramel Bourbon Sauce + King’s Hawaiian GIVEAWAY!! I am a sucker for Bread Pudding. There’s something so darn comforting and mouthwatering about a bowl full of this goodness. Rich, sweet–almost sinful. With Autumn finally coming around, it was the perfect time to make an apple version highlighting the warm spices of cinnamon and nutmeg. And the only thing to take it over the top was a decadent drizzle of Caramel flavored by good ol’ Bourbon. Inspired by my visit with the great o’hana of King’s Hawaiian, I used the slightly sweet Original Hawaiian Sweet Round Bread for the pudding. I also cut back on the amount of sugar in the custard base since the final dessert would be sweet enough from the luscious Caramel Bourbon sauce. But the awesomeness doesn’t stop here! One of our lucky readers has the chance to win a cornucopia of goodness courtesy of our friends from King’s Hawaiian! 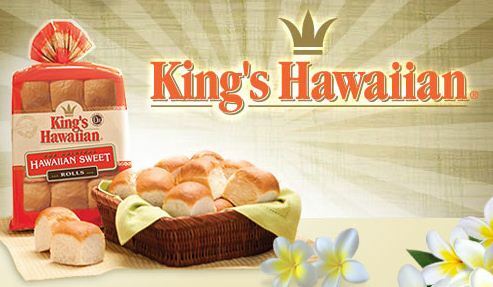 The winner will receive a vast assortment of King’s Hawaiian baked products, King’s Hawaiian coffee, apron and more!! Needless to say, you will be a very HAPPY CAMPER! Follow @CulinaryChron on Twitter (If you already Follow us, leave a comment indicating so). The deadline to enter is Monday, October 8th at 5pm (PST) and the winner will be announced the next day. Best of luck friends and MAHALOS King’s Hawaiian!! Pssst! 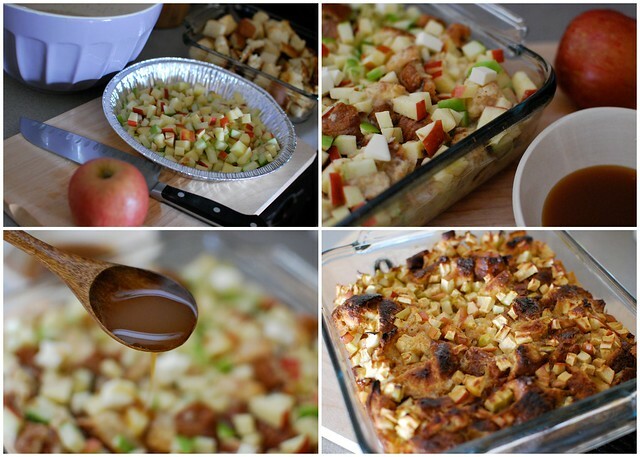 Don’t forget to make this Apple Bread Pudding! In a heavy bottomed saucepan, dissolve the sugar and water over medium-high heat. Once the liquids begin to bubble, swirl the saucepan around and continue cooking until it reaches an amber color. Reduce the heat to low and whisk in the cubes of butter one at a time until fully incorporated. Remove from heat and whisk in the heavy cream. (The liquids will bubble up so be careful!) Stir in the Bourbon and a few pinches of sea salt (optional). Set aside. Preheat oven to 350 degrees F and thoroughly butter the bottom and sides of an 8×8 inch pan. In a large bowl, whisk together the first 8 ingredients of the bread pudding. Add in the cubed bread and apples making sure that they have been coated by the custard mixture. Let set for 5 minutes to allow the bread to absorb some of the custard. Pour the entire contents into the greased pan and spread evenly. Take a few spoonfuls of the Caramel Bourbon Sauce and drizzle on the top. Bake the Bread Pudding in the preheated oven for approximately 35-40 minutes until the custard has set and the top is golden brown. Remove from the oven and allow to slightly cool before cutting. Serve warm with additional sauce drizzled on top and fresh whipped cream. Next Post Flourless Chocolate Chip Biscoff Cookies + King’s Hawaiian Winner! the first thing i would make with the Kings Hawaiian Bread is my “world famous” cheeseburgers. i’ve made them with the sweet hamburger buns and they were great. 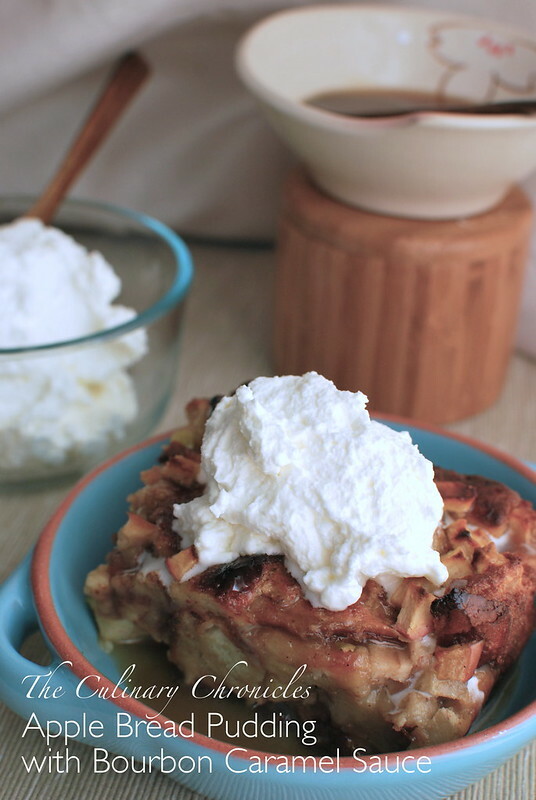 Oh my gosh–I’d have to make this bread pudding first! I also subscribe to email updates! First thing should be mini slider buns- but I’ll probably eat one by itself immediately! They are so good! I subscribe to The Culinary Chronicles with Google Reader! I liked Kings Hawaiian on Facebook! I’d make a grilled apple and brie panini! My favorite Kings Hawaiian French Toast! The sweet bread is good by itself. I’d use it to make some egg salad sandwiches. I love King Hawaiian’s bread. First thing I would make would be some Hawaiian Pineapple and pork sliders. YUM! i want that apron and mug! lol. please!!! I would make some french toast, for sure. First II make pork burgers. I like Kings Hawaiian on Facebook. The first thing I’d make are ham and swiss cheese sliders! They taste amazing on this bread! Thanks for the opportunity to try other products of theirs! I now Subscribe to The Culinary Chronicles! First of all, I plretty much want to make that bread pudding right now. YUM. I’ve had a hankering for some pineapple pulled pork. I have a feeling that would go really well with the Hawaiian rolls. Btw, your link to the facebook fan page seems to be broken. But I managed to get around that and like you on Facebook anyway. Thanks for the giveaway! I would make bread pudding first. The first thing I’d do is eat an entire bag on my own. Then I’d probably make a delicious breakfast sandwich. Yumm. I would make a filling of fontina, bacon and green onions and bake them until the buns are slightly crunchy on the outside. I subscribed to your email updates!